Simon Turner at Northrop & Johnson Asia sends word of a $450,000 price drop on 30.48m motor yacht Aquarius W for sale jointly with Kevin Merrigan in Fort Lauderdale. Built by Turkey’s Ge-Ta yard in 1991 to Lloyds class, she accommodates up to seven guests in three staterooms and twin Cummins diesel engines give her a range of 2,500 nautical miles. 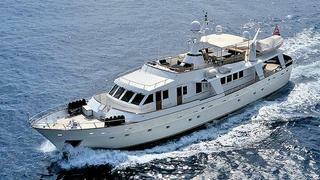 On display at the Antibes Yacht Show, Aquarius W is down from €1,900,000 to $1,450,000.